Nothing. Only good thing was the staff helping me check in. She was lively and always smiling and made me feel comfortable in rather a scary location. The bed was very comfortable. The food at the Cafe was good!!! The water was turned off in the morning. I couldn’t brush my teeth shower or wash my hands. It was pretty upsetting knowing that I couldn’t use the amenities that I paid for. The staff was friendly. The grounds appeared clean. Located where we needed to be in North Las Vegas for a morning drive North. The pillows were great and the air conditioner was brand new, so that was nice. Siegel Slots and Suites (No Resort Fees) This rating is a reflection of how the property compares to the industry standard when it comes to price, facilities and services available. It's based on a self-evaluation by the property. Use this rating to help choose your stay! 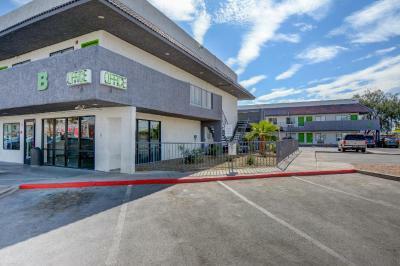 This motel is 8 miles from downtown Las Vegas and the famous Strip and offers unique amenities including an outdoor pool and on-site casino. Siegel Slots & Suites features free on-site parking. Guests can also enjoy the on-site restaurant and bar. Points of interest, such as Nellis Air Force Base, are only minutes from the Siegel Slots. Guests can also enjoy a variety of shopping and dining options in the nearby area. When would you like to stay at Siegel Slots and Suites (No Resort Fees)? Cable TV is featured in this room. Free toiletries and a small fridge are also provided. House Rules Siegel Slots and Suites (No Resort Fees) takes special requests – add in the next step! Siegel Slots and Suites (No Resort Fees) accepts these cards and reserves the right to temporarily hold an amount prior to arrival. A security deposit is required upon arrival for incidentals. This deposit is fully refundable upon check-out and subject to a damage inspection of the accommodations. Please contact property for details. Siegel Slots and Suites reception is open Monday through Thursday from 08:00 until 20:00. On Friday from 08:00 until 22:00. On Saturday from 08:00 until 20:00. And on Sunday from 08:00 until 18:00. Please inform Siegel Slots and Suites (No Resort Fees) of your expected arrival time in advance. You can use the Special Requests box when booking, or contact the property directly using the contact details in your confirmation. I like the price and rooms. Nothing. The pictures indicated to have a kitchen but there wasn’t any. Refrigerator was disconnected for defrosting and there is water all over the floor in the morning as we were not aware of it. The blanket had stain marks and hairs on it. Location was really scary and finally check in took a lot of time and too many signatures on conditions. Poor location felt like I was in the ghetto. I had to sign for the remote handed to me in the office. Residential housing not a hotel. Need maintenance to check room out better, things need work. The smell and the dirt in the room. Very loud all night long. I guess no one had to work. The showers need to be renovated. The faucets don't work properly. You never know if you are going to get hot water or cold water. The shower curtains are to close to the inside of the tube. They stick to you while showering. This is not a true motel.They rent rooms buy the week or month.also. People hanging out all hours very noisy and load.More like an apartment complex. While we were check in around 9:20 pm , some body robbed our laugge and the siege hotel they don't get the responsabillity !! My car it was right in front of the oficce and the security guard !! Really no Housekeeping, front desk is the housekeeping, after 8pm your completely on your own. No Ice machine, no internet or I was told the free internet access code was good for only your first night only? So I guess their marketing efforts do not want you to stay more than one night? It's a shame that when good people embark on their location that this Seigal Suites on 5011 Craig., treats that good tenants as though they are going to steal towels, no housekeeping no ice machines no free internet past one night and the signal there is apparently so bad that my son could not even call me because he said it just would not connect for even a simple phone call. Better marketing efforts would be to realize and know the good tenants from the bad and try to keep those good tennis coming back instead of only retaining the ones that steal remotes damage rooms & take towels. Very poor hotel stuff. While check in, lots of paper given for signature. Check in was too complicated. It took 20 minutes. Same paper repeatedly given for signature. Environment didn't seem to be safe. Window blinds were broken, so was key door latch. Room is key operated, no magnetic key cards, hey we are in the USA and not in the 1990s. Front desk is not open during 22.00-08.00 hours. If you come in that time frame, you are in the trouble. I just needed to check out at 06.00 am in the morning, I asked how, front desk told me leave the key in the room and go. Come on! If someone who is not authorized enters the room and get the key, how would you make sure? They will charge you $15 in that case. I hope it wouldn't. All in all, I do not recommend this hotel to anyone. I didn’t like the old looking room and the fact that people are hanging all out in front of the rooms making a person very uncomfortable.